If you go out fishing in Flensborg Fjord, you must have a valid fishing license from the responsible Danish ministry (Ministeriet for Fødevarer, Landbrug og Fiskeri, NaturErhvervsstyrelsen). You can either buy a day ticket, a seven-day ticket or an annual ticket on the ministry’s homepage by clicking here. A day ticket costs 40,- DKK, a seven-day ticket costs 130,- DKK and an annual ticket costs 185,- DKK. On the fishing license, you will find your fishing numer which is you legitimation when fishing. Therefore, you should always have it on you. Once you have the number, you can enjoy fishing without a limit. Anglers between the age of 18 and 65 must have a valid fishing license to fish from shore and sea in Denmark. 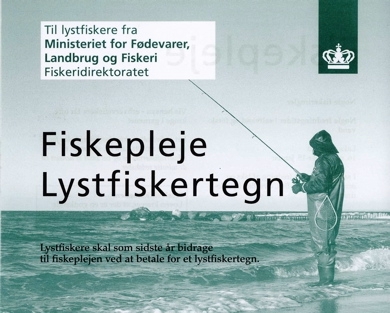 The fishing license can be purchased at tourist offices, post offices in the region around the Fjord or on www.fisketegn.dk. The earnings received by the fishing licenses are used for hauls, restoration etc. of streams and lakes. But also for measurements and research, concerning the fish’s reproduction, growth etc. This means, the money is used for fish, which results in brighter conditions for all kinds of fishermen.